One-piece steel core construction with a thick coating of premium urethane permanently bonded to the steel core. Wear resistant matte textured surface keeps bumpers looking new for longer. 3 year limited warranty. Sold individually. Made with high quality virgin rubber, our metal cores have a machined radius on the edges to eliminate internal sharp edges and cutting from within. Anchor notches and grooves are then cut into the iron and a proper bonding agent applied to allow a thick coating of rubber to permanently bond to the metal. 2 year limited warranty. Sold individually. Classic hex design prevents rolling on flat surfaces. 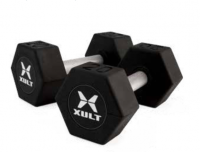 32mm (5-50 lb) or 35mm (55-100 lb) handles. Sold as a pair. Made with virgin rubber to ensure the highest quality. A thick rubber coating is anchored to the solid steel core. 2 year limited warranty. Classic hex design prevents rolling on flat surfaces. 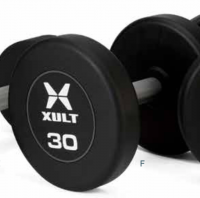 32mm (5-50 lb) or 35mm (55-100 lb) handles. Sold as a pair. Premium high-grade odorless urethane with a wear resistant matte textured surface is permanently bonded to the solid steel core. 3 year limited warranty. Made with virgin rubber to ensure the highest quality. A thick rubber coating is anchored to the steel core. 32mm (5-50 lb) or 35mm (55-100 lb) handles. 2 year limited warranty. Sold as a pair. Premium high-grade odorless urethane with a wear resistant matte textured surface is permanently bonded to the solid steel core. 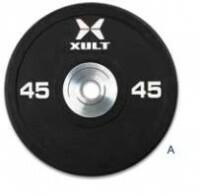 32mm (5-50 lb) or 35mm (55-100 lb) handles. 3 year limited warranty. Sold as apair. Available with traditional round heads or multi-sided to limit rolling on a flat surface. Premium high-grade odorless urethane with a wear resistant matte textured surface is bonded to the solid steel core. Easy to read weight markings are permanently attached to ensure longevity. 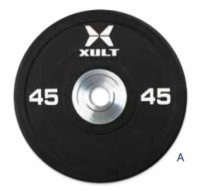 32mm (5-50 lb) or 35mm (55-125 lb) handles. 3 year limited warranty. Sold as a pair.